When I run this in my browser’s JS console, it checks out. 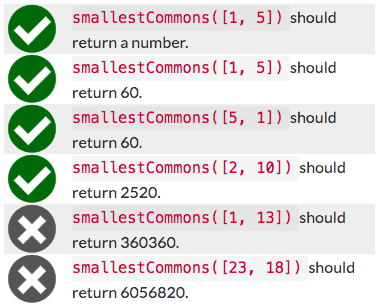 However, the FreeCodeCamp tests don’t seem to work. I think I’m losing my mind. User Agent is: Mozilla/5.0 (Macintosh; Intel Mac OS X 10_12_2) AppleWebKit/537.36 (KHTML, like Gecko) Chrome/71.0.3578.98 Safari/537.36. When it fails the last few tests (especially if it works elsewhere) it’s because your algorithm isn’t efficient enough. The FCC test has a timeout on it. See if you can find ways to make it more efficient.